Generations of brilliant thinkers, from Marcus Aurelius to Paul-Henri Thiry, baron d’Holbach have reasoned that if we knew the speed and direction of every particle at one point in time, we could predict the future with certainty. This idea, named ‘determinism’, was swept aside when quantum physics introduced the uncertainty principal: one can either know the speed or location of a particle, but not both. That should not prevent us from trying to make accurate guesses, especially when it allows for better investments. In Peer Lending, when a loan will default is as important as if it will default. This ‘when’ question (as in ‘when the poop hits the fan’) can be addressed by survival statistics. Today we’re looking at a product of this research called the hazard curve, and how it works. But because time-based studies of cash-flow events are slightly tedious, we’ll use as example something more entertaining… and featuring Vin Diesel. The hazard curve represents the probability that something will terminate. Since almost everything has a creation and termination date, just about everything is on a hazard curve; planets, people, cars, etc. The system depends on time; for instance, a car tire is more likely to fail (i.e., get a flat) in its fifth year than first year. By looking at historical data and doing some math, it’s possible to tell when in something’s life it is most likely to die. Hazard curves have a lot of practical value in a large variety of industries. For instance, research doctors use hazard curves to judge the effectiveness of medications. If the patients’ hazard curve has shifted or changed shape, (the probability of death is sooner or later), this may indicate that the medication did something. Mechanical engineers use hazard curves to predict when parts will fail. If the probability that your car’s engine will seize after using 10,000 miles of oil life is ten times that of a car that has only used 5,000 miles of oil life, it might be important to recommend that drivers change their oil every 5,000 miles. LendingRobot uses hazard curves to determine which loans to invest in. By looking at similar borrowers, it’s possible to figure out which/when loans will likely default and give the appropriate investment recommendations to the investor. To calculate a hazard curve, one counts how many events accumulates over time. I’m betting you don’t normally daydream about how to use hazard curves in your everyday life. But the surprising thing is how universal they are, and how they can be used to predict even modern films. We’ll use hazard curves to take a look at a box office franchise hit and turn the unknowable into the probable. The results may even surprise you (don’t peak ahead!). The film franchise “The Fast and the Furious” is currently comprised of seven movies, with an eighth movie, “Fast 8” scheduled for release on April 14th, 2017. We’re going to use hazard curve analysis to do some predictions about what will happen in the new film. If you haven’t seen any of the previous seven movies, the films are about cars: car racing, car heists, and lots of car crashes. Car crashes can be ideal for a hazard curve analysis; we know when the film starts (when all cars are “created”) and we know when the crash happens. If the uncertainty principle was strong (i.e., Hawking’s mini black holes rip through the film’s plot) it would be impossible to tell how many, and at which minute, car wrecks would be in the next franchise installment “Fast 8.” But if past behavior is indicative of future events, we can use statistics to determine some discrete events in the film, such as how many car wrecks would appear in the 8th film, and when they might occur. As a side note, this statistical analysis required gathering historical data across the 821 minutes of the film franchise. It was difficult work, and required the help of three pizzas, 23 beers, and half a pack of Oreos. In the following graph, the y-axis represents amplitude – a larger number means a crash is more likely, while the x-axis represents time – 0 being the beginning, and 1 being the end of the movie. Each movie’s hazard curve is represented by its own color. There are some clear patterns that emerge from the graph. Almost every movie is bimodal with two humps, meaning that from the point of view of a car, there are two main danger points in the movie. In five out of the seven movies, the second hump is greater than the first – meaning that a car crash is more likely to occur later rather than sooner. It is interesting to see that Furious 7 has these humps reversed. The maximums of the two humps are, on average, separated by a bit less than half the movie’s duration. Lastly, both the beginning and end of each movie are relatively safe. 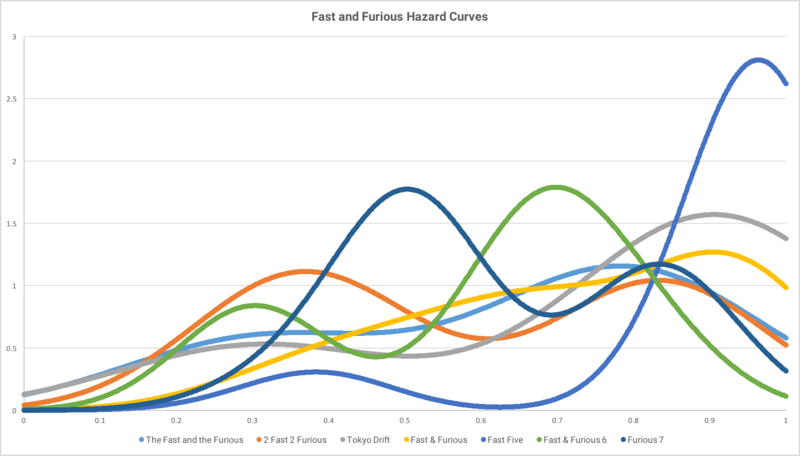 In practical terms, we can combine these hazard curves, which forms our prediction for the next movie. The movie begins slowly, as the gang grieves the loss of Brian O’Conner (previously played by Paul Walker). About twenty minutes in, unexpected trouble comes knocking on the door. Maybe Ian Shaw (Jason Statham) is back for vengeance, this time driving an even bigger and faster supercar. At the 50th minute, Ian and his cronies drive their supercars really fast, after the super cool object that will give him undisputed rule of the streets of Los Angeles. Obviously this is bad, and a wild car chase scene ensues. Unfortunately for auto lovers everywhere, nine beautiful cars are destroyed in the fruitless chase. Ian seems invincible, but Dominic Toretto (Vin Diesel) and the gang recoup and come up with an improbable plan to break Ian’s hold on the super cool object and claim victory. Perhaps surprisingly, it involves a lot of cool cars driving really fast and dangerously. Airplanes, monster-trucks, or a submarine may also be involved. At 113 minutes, the improbable plan is put in motion. A stomach-wrenching ultimate car-battle ensues, good versus evil, Vin Diesel’s oiled biceps against Jason Statham’s iconic ¼ inch beard. Approximately 21 more cars should be destroyed in the following 12 minutes. While it is, perhaps, less exciting than figuring out when cars will crash in the movies, calculating the hazard curve in peer lending allows for safer real-world investment decisions. In peer lending, LendingRobot uses hazard curves to make tens of thousands of real, executable investment decisions every day. Which in turn produce steady returns for years to come, making a happy ending for thousands of clients.